The government in Pakistan's eastern province of Punjab is struggling to control a growing dengue fever epidemic, officials say. They have warned that it threatens to affect other parts of the country. More than 4,000 cases of dengue fever have been reported in the past two months, officials say, and at least eight people have died. While the disease is not new in Pakistan, experts say it has spread fast and may reach crisis proportions. They say that the illness is thriving because of poor hygiene, an absence of control measures and the fact that recent heavy monsoon rainfall has lowered temperatures and provided lots of water - ideal conditions for dengue-carrying mosquitoes. Dengue fever is a tropical disease transmitted by mosquitoes that breed in stagnant water. According to the World Health Organisation, the incidence of death among infected patients is 4%. 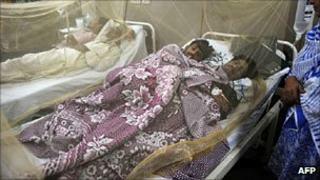 The first case of dengue fever in Pakistan was reported in the southern port city of Karachi in 1994. The province of Punjab - particularly its capital, Lahore - have seen a growing number of cases since 2007. Punjab Health Secretary Jehanzeb Khan said that this year more than 4,000 cases of dengue fever had been reported, a significant increase over previous years. The eight people who have died so far include Ataullah Siddiqui, head of the provincial department for minerals and natural resources. Mr Khan said more than 3,500 infected people live in Lahore city. The head of the city's Jinnah Hospital, Dr Javed Akram, told the BBC that there are several reasons why the virus is concentrated in Lahore. "It's a large city with poor public hygiene," he said. "We have also had heavy rain for the second year running. In many areas the sewerage system was choked, creating water ponds. "The city also has vast open spaces and public parks where water has accumulated. In addition, the rains have brought down temperatures by several degrees, creating ideal conditions for the dengue mosquitoes to breed." Dr Akram says the spread of the disease to other parts of Punjab province has been caused by the government's failure to announce and enforce travel restrictions and its failure to quarantine affected people. "In the absence of these measures, we expect a greater epidemic next year," he said. Officials say the provincial government has set up a telephone helpline and issued pamphlets to create awareness about the fever. The government has also banned morning assemblies in schools for two months to prevent children's exposure to mosquito bites. It is now considering a 10-day closure of schools. Meanwhile, a team of doctors from Sri Lanka is expected to arrive in Lahore today to help combat the epidemic.